Amaya is an open source software project hosted by W3C. You are invited to contribute in many forms (documentation, translation, writing code, fixing bugs, porting to other platforms...). The Amaya software is written in C and is available for Windows, Unix platforms and MacOS X. The application was jointly developed by W3C and the WAM project (Web, Adaptation and Multimedia) at INRIA. 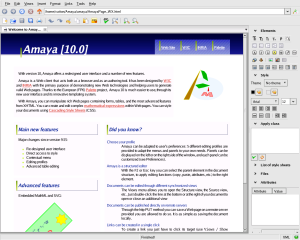 Amaya 11.4.4 (18 January 2012). Distributions are available for Linux, Windows and now MacOS X PowerPC and Intel. Amaya is covered by the W3C Software Notice and License. The icon can be inserted in your Web pages when they are created and edited by Amaya.